I’m so excited for this week. It’s APPLE WEEK! A bunch of bloggers are posting apple recipes all week long. On Friday, we are each sharing one of our favorite Apple Recipes. At the bottom of this post you have a chance to win an AWESOME giveaway. Thanks to Crunchpak for helping us bloggers out. Not only did they provide the bloggers with some coupons for free apples, but they are also donating an awesome prize for the winner. I meant to say WINNERS. There will be TWO winners to this giveaway!! Each receiving the same awesome prize. But first, let’s get to the recipe. So originally my plan was to make a Caramel Apple Cupcake. I tweaked an old recipe I had for Zucchini cupcakes, and when these came out of the oven, they really were more of a muffin. Granted, you can call them cupcakes if you want…but not me. See muffins? You can eat for breakfast. 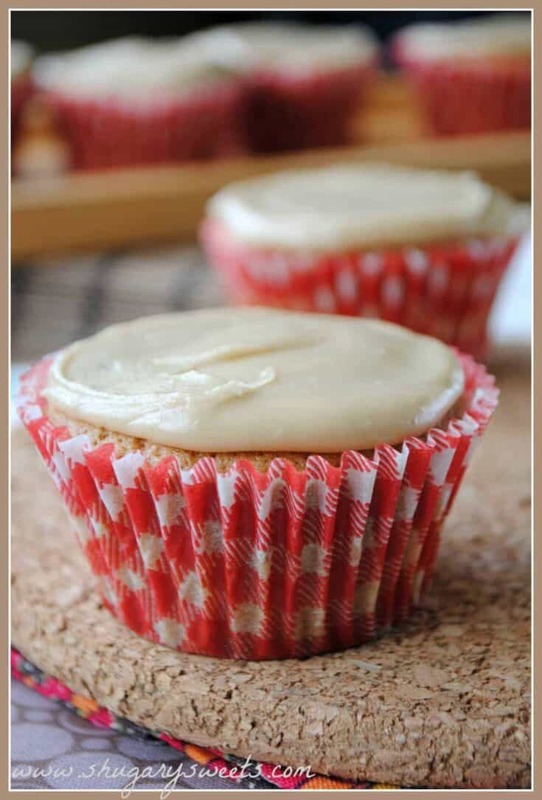 And muffins with caramel glaze, totally perfect any time of the day with your cup of coffee. Jocelyn and I decided in addition to all the Swag from Crunchpak, we would throw in some goodies of our own. The winners will each receive one swag bag from Crunchpak, including two insulated tote bags, two soccer blankets, two thermal mugs and one dozen coupons for FREE Crunchpak apples! They will also each receive an apple pie press, a bag of Milky Way Caramel apple candies, a $10 Starbucks gift card and a free ticket to register for Online BlogCon!! 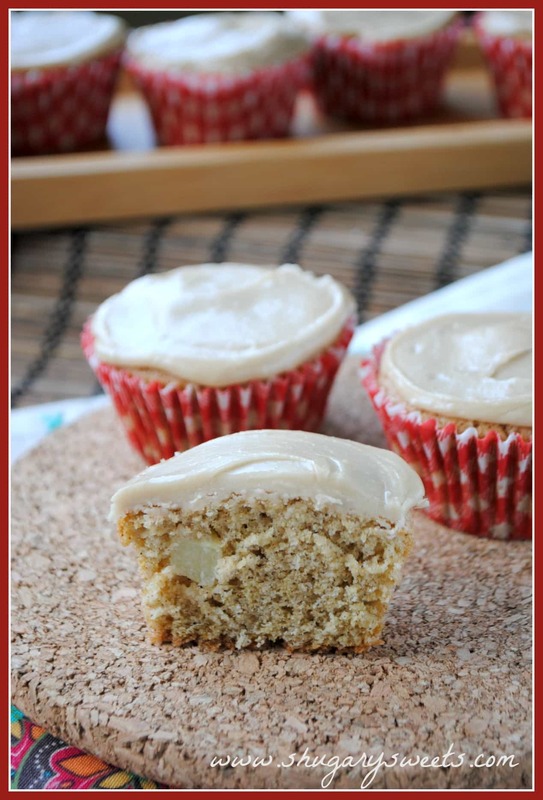 Apple Spice Muffins with Caramel Glaze: perfect recipe for breakfast, brunch or dessert! In large mixing bowl, beat sugar, eggs, oil, orange juice and almond extract. Add flour, cinnamon, baking powder, baking soda, salt and cloves. Mix until combined. Fold in apples. Fill paper lined muffin cups to half full. Bake in a 350 degree oven for 15-18 minutes. Remove and cool. 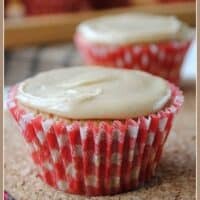 For the frosting, in a medium saucepan, heat brown sugar, butter and 1/4 cup milk (4Tbsp). Bring to a boil over medium heat and continue to boil for 2 full minutes, stirring constantly. Remove from heat and add vanilla. Cool 15 minutes. Whisk in the powdered sugar and remaining milk until smooth. Spread on cooled muffins. ENJOY! These look soooo good. I adore this glaze! Thanks Cassie, can’t wait to see your recipe!!! This glaze is amazing! I think I’m in love with these muffins. YUM!!! 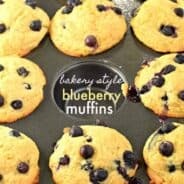 I am a sucker for muffins and that glaze sounds diving!! Jocelyn – I second the glaze & coffee combo!! My SIL makes some great Apple Cheesecake Bars with a Caramel Drizzle each year for Thanksgiving. Yum! That sounds amazing…I think she needs to guest post that recipe on your blog!! I love Simply Recipes’ apple pie! I have an apple pound cake recipe that I love! thanks for coordinating such a great week and your muffins and the GLAZE!!! sounds incredible! Oh no!! I have finished all the apples! I want these muffins! Aimee…these are AWESOME. I’ve been excited for this week because I can’t wait to see what you come up with! Thanks girlfriend!! I love apples so I’ve been pretty excited too!! Wait till later in the week….just sayin….that’s when I bring out the big guns! So excited for apple week!! And we both know caramel and apples are a good way to start it. Aimee, thank you so much for your hard work putting this together! So amazing to be apart of! Love these muffins. You’re so sweet. I definitely like the way we started the week off!! Glad you could be a part of it! Wow these look delicious! My favorite apple recipe is apple crumble. what a great recipe! hope i win this great giveaway! OMG…I just might run out of paper and/or ink printing all these yummy looking recipes!!! Apple week–you’re kidding! This sounds like a swell idea. Out of curiosity, how did you gals get the idea to form this great week blog-off? You make such a tight-knit community, I just love hearing about these great events you pro planners all put together. Thanks for sharing! Jocelyn and I met for a fun day and we brainstormed the idea months ago of having an apple week. We emailed a group of bloggers to see if they would be interested and they said yes! Not pro planners at all…just have to reach out. Best part of blogging, building a community!! those look so delicious! i can’t wait to make them with some fresh cider apples! My favorite Apple recipe is Fried Apple Pies! They are yummy! I love making caramel apples at home! I love apple cinnamon chip cookies! Amazing! 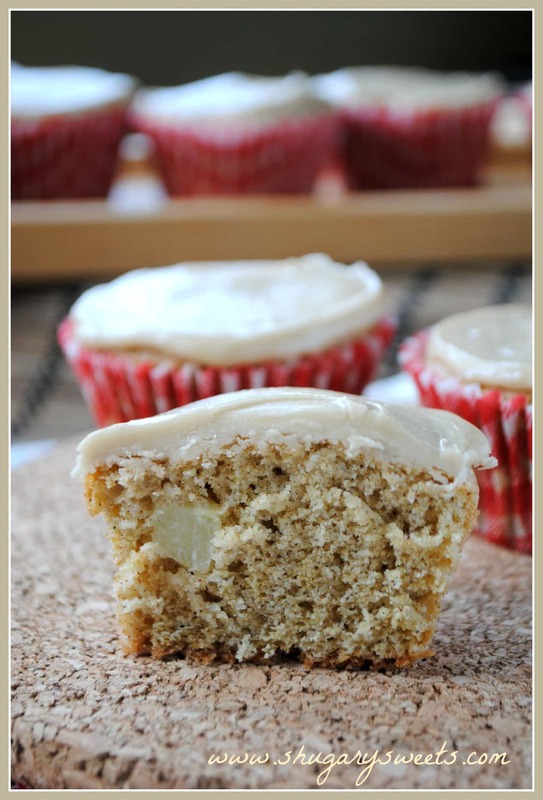 I have an apple spice cookie recipe that will surely go nicely with these muffins! I think I would do a caramel drizzle next time around. Thanks for sharing! 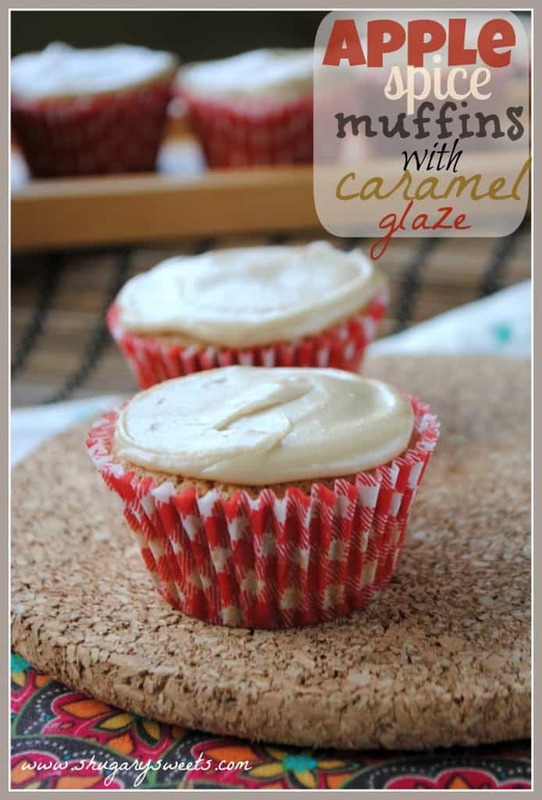 These muffins look so good, especially with that glaze! 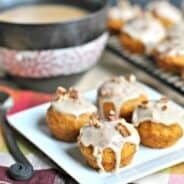 My favorite apple recipe is homemade apple pie with a crumb topping, but those muffins look amazing. I can’t wait to try them! I have a great apple cake recipe and I love caramel apple cider cookies. Found your blog via Pinterest and can’t wait to make some of your recipes! My favorite apple recipe was for an apple crumb cake – it was beyond delicious!! lol, we are both totally thinking caramel glaze today! I’m dying over your scones!!! Apple pie with a crumb topping. Scrumptious! 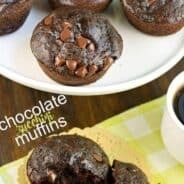 I’m a broke college student with no muffin tins, but this sounds good enough to make me take the train ride to Target to buy some just for this recipe! Apples wrapped in crescent rolls, then baked with a mountain dew sauce. It’s unhealthy, it’s sorta gross, but it’s super delicious! I love Apple Crisp with Ice Cream! What a heavenly little muffin! My mom’s apple crisp recipe is my fave by far! I’m looking forward to making these muffins, though!!! wow! All of these recipes look soo good! I love baking with apples and pumpkins. My family only likes the apple part though. These cupcakes look delicious. My favorite apple recipe is probably apple crisp – I use the one from Joy the Baker. It’s delicious! Ooooo, I’m all for muffins with glaze. I’ll take one for breakfast and two 😉 to go with my afternoon coffee. Thanks for organizing such a fun week! I love the idea of so many apple recipes! My mom makes the best apple pie. It’s one of my favorite parts of fall 🙂 These muffins for breakfast though could definitely rank up there. I love apple cobbler. Very very much. Apple crisp. I just tried the BEST new recipe! And it’s really easy! WOOT! I love all your receipes! I keep forgetting to follow you on Pintrest. I’m gonna go do that know. My favorite apple receipe is for crock pot apples. All the insides of an apple pie, with none of the worry about crust! Favorite apple recipe would be caramel apple pie! So yummy! I am all over the Apple Cheddar Bacon Sandwich from Jam Hands! Sounds like lunch! I love making homemade applesauce, but that doesn’t involve much of a recipe, so I’m going to say my grandma’s Apple Kuchen. What an awesome giveaway! I love love love Caramel Apple Pie. It’s da bomb. I love caramel apple pie. All of these recipes sound amazing! I need more paper and ink.